Surgery for Swan, Pendlebury and more Watch Director of Football Neil Balme provide the latest on the injury status of several key Magpies, Swan, Pendlebury, Frost, White, Sinclair and more. 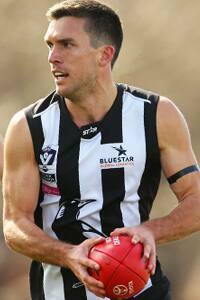 Clinton Young played 21 games for Collingwood after leaving Hawthorn at the end of the 2012 season. Collingwood will make at least six changes to its primary and rookie lists as it prepares for the 2016 season. With the club’s AFL and VFL campaigns over for this year, it has been decided that Sam Dwyer, Clinton Young, Tony Armstrong and Michael Manteit will be released. As previously advised, Lachlan Keeffe and Josh Thomas will also be delisted in the hope both can return to Collingwood as rookies. Dwyer and Young were primary list players this year, with Armstrong and Manteit on the rookie list. Dwyer’s 39-match career with Collingwood was a triumph for persistence. Recruited from Port Melbourne in the 2013 rookie draft as a 26 year-old, Dwyer had waited eight years for his chance. He seized it with a superb performance in just his second match, on a big occasion against Carlton at the MCG. In all, he played 21 matches in that debut season. In 2015, the popular Dwyer made five appearances. Young played 21 matches with Collingwood across a three year stay at the Holden Centre, where injuries unfortunately dogged him. A premiership player with Hawthorn in 2008, Young finished his time in Black and White as an influential senior member of the VFL side which narrowly lost a semi-final to Sandringham on Sunday. Armstrong was with Collingwood for two seasons, for a total of six matches. A former Adelaide and Sydney half-back, ‘TA’ was a first class clubman who, like Young, finished as a senior member of the VFL side. He played one AFL match in 2015. Manteit was recruited in the 2015 rookie draft from Melbourne High Old Boys and was also a member of the VFL team which went down to Sandringham by seven points. He was unable to break into the AFL side. Collingwood Director of Football, Neil Balme, said the imminent delistings were an inescapable reality of AFL life. “People don’t always see what sacrifices are made to try to forge an AFL career. The game asks an enormous amount of its players and all of the boys did what they could to give themselves a chance,” Balme said.